It's a lovely story really... Two women with a lifelong love of chocolate came together with a dream to share their mutual fave and their drinking chocolate recipes with the world. Just like that, Jaz & Jul's was born, starting out as so many small foodie businesses do, with friends tasting concoctions in brewing in hot pots on the stovetop in a home kitchen. 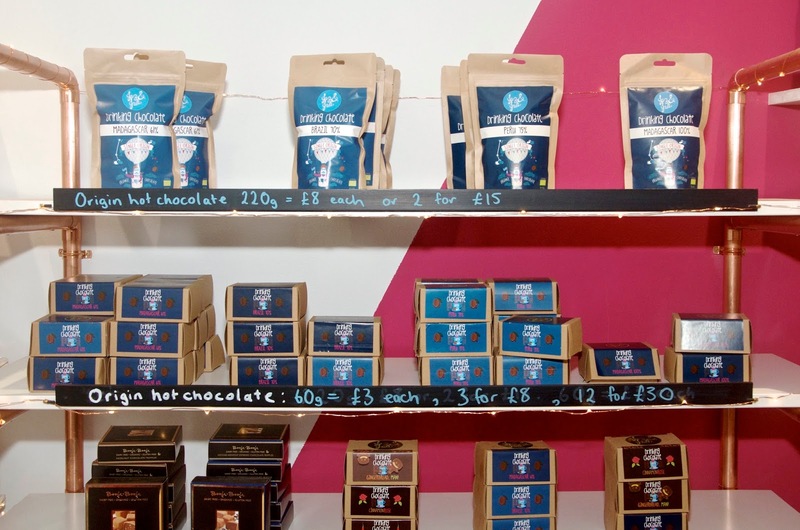 Selling their hot chocolate mixes online, at festivals and in markets, these entrepreneurs opened the Chocolate House in 2015 for a more permanent place to get a fix. I've always loved hot chocolate - I mean, who doesn't? That said, when I went to Jaz & Jul's for a little taster, I realised that it had probably been more than a year since I'd had one... It's not something I indulge in regularly. I didn't know what I was in for to be honest - these ladies know their chocolate and they're making some of the tastiest hot drinks in London. Jaz & Jul's is just a short walk from the Angel Tube Station, through Chapel Market, which is a great spot to visit on a Sunday morning, especially if you're a foodie. You can peruse the foods and produce on display from local vendors and then take a break with some divine hot chocolate like you've never had before at the Chocolate House! 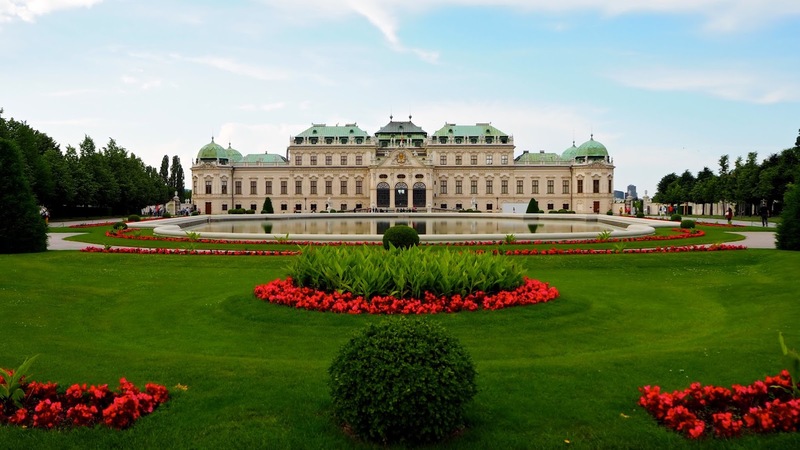 It's not easy to miss Jaz & Jul's with it's bright blue facade... Colorful, whimsical and fun, it certainly grabs your attention from the street, so happy & cheerful that it makes you want to go inside immediately. 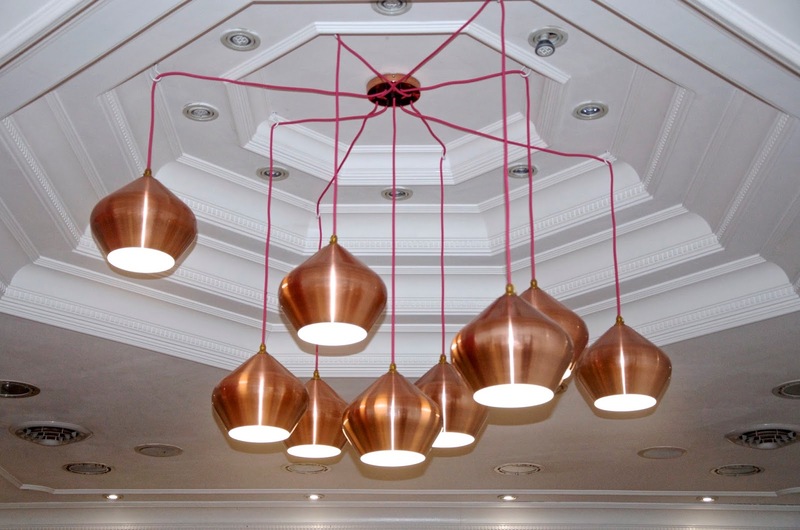 I was taken by the chandelier almost as soon as I opened the door, a big beautiful sculpture that reminds me a little of the laboratory in Edward Scissorhands with its fantastical design in warm copper. Actually, there's a lot of copper throughout the shop and it gives it a chocolate factory feel like something out of a Willy Wonka movie. Chocolate memorabilia and knick knacks can be found all over the Chocolate House. 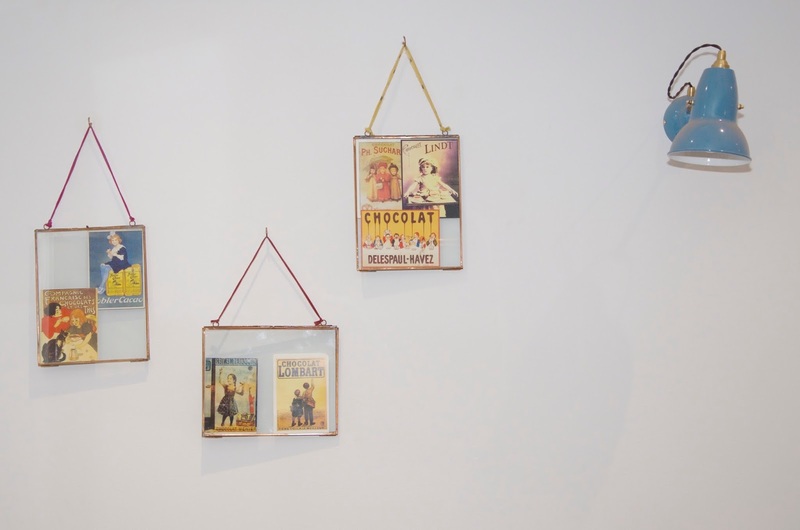 Everything from vintage postcards in frames to shelves lined with books dedicated to chocolate can be found there. It's a chocolate lover's dream. Upstairs at Jaz & Jul's there's a bright, community feel with tables by the window and right in the middle of the action, but head downstairs and there's an entirely different vibe with plush couches, bright pink & white walls and a whole other level of coziness. Twinkle lights, bright colors and copper piping keep the feeling whimsical while bags of cocoa beans slung into a corner remind you what you've come for. 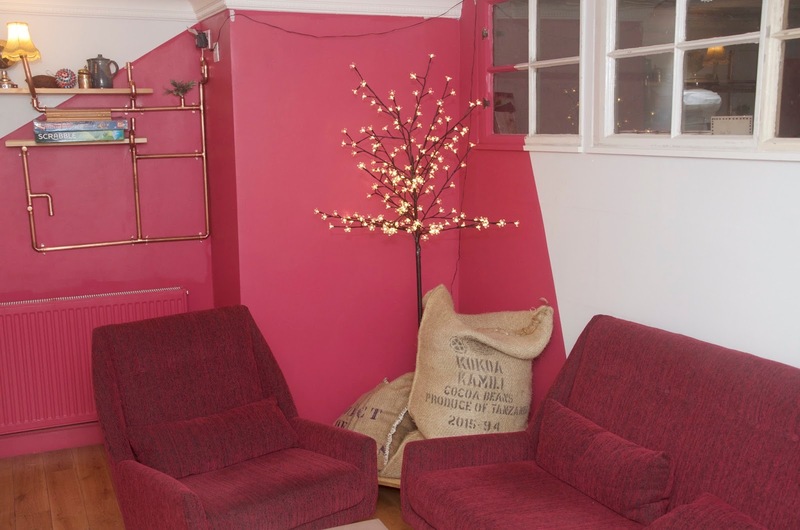 With sprouts coming out of copper pipes, copper kettles all around and brightly coloured accessories, you could nearly imagine you've come to meet up for a hot chocolate with Truly Scrumptious from Chitty Chitty Bang Bang. 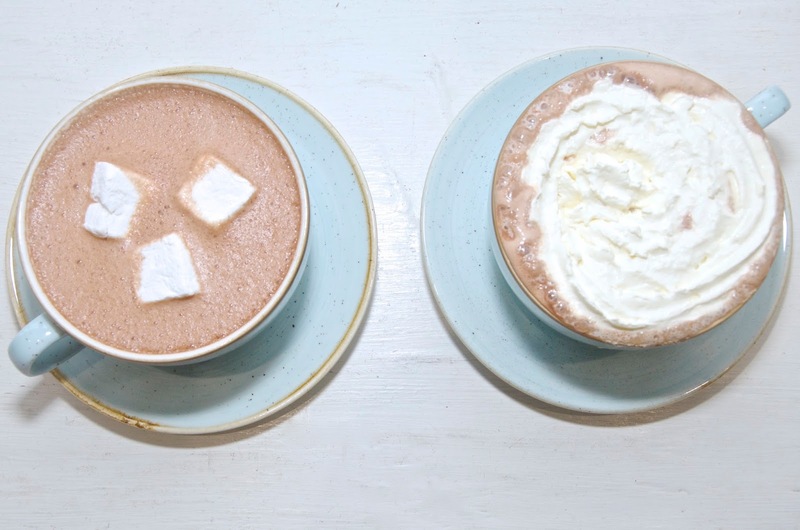 It's stunning place to hang out for adults (and they even offer boozy hot chocolate options! ), but I imagine the kiddos would love it too! 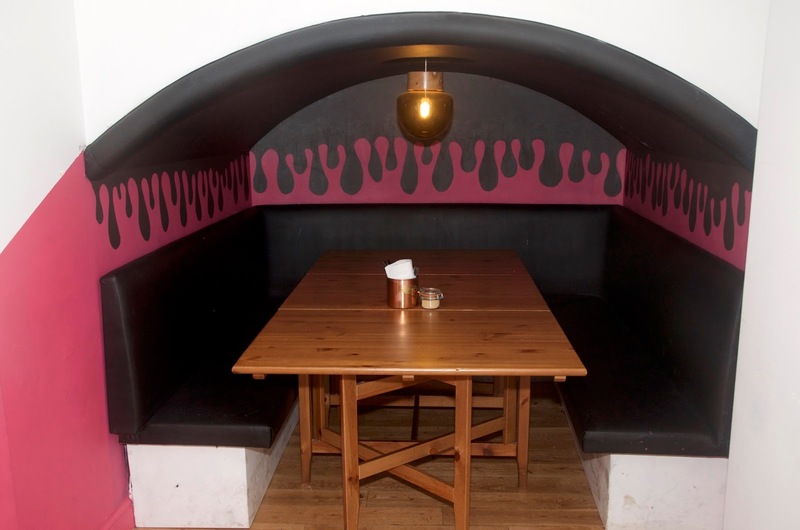 Nestled in the back of the downstairs area are two little alcoves, painted to look like they're dripping with chocolate and featuring cozy booth-like seating around a large table. If you're travelling in a large group, there's plenty of seating in the downstairs area and it's also available for events... It would be ideal for a chocolate lover's or children's birthday party among other various occasions. 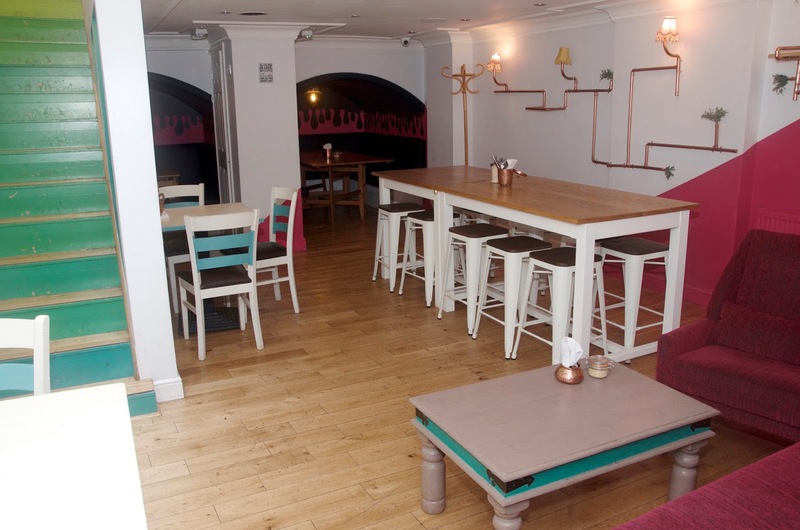 For more information about hosting an event, click here to get in touch. While drinking chocolate may be the main event, there's no shortage of appetising snacks to enjoy with your hot beverage. 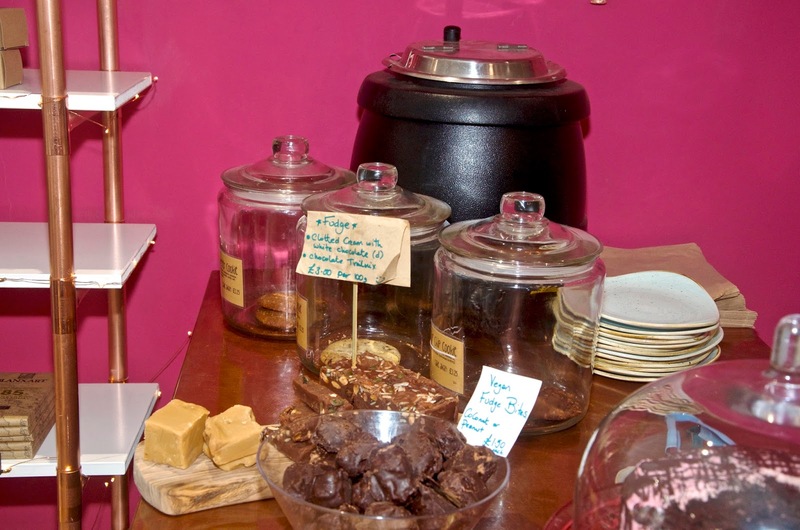 Cakes, biscuits, fudge, tarts and breads are all on offer alongside a menu offering breakfast, lunch and weekend brunch options among other things. There's even a chocolate fondue for two to share if you're feeling up to it or milkshakes on the menu if a hot drink isn't what you're after. Some of the dishes are Vegan and many other dietary requirements can be catered for, so be sure to ask for recommendations if you need them. If you don't want anything sweet at all, that's okay too... 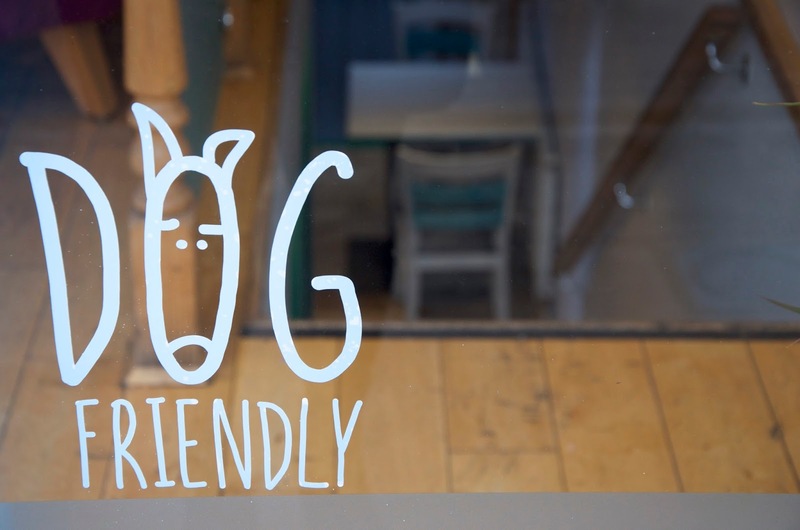 They serve Monmouth Coffee for those who are loyal to caffeine among other drinks and savoury food options as well... The menu is too extensive to list out, but you can view it here. Jaz & Jul's uses certified organic chocolate, meaning that it's grown and produced without the use of synthetic fertilizers, pesticides, hormones or GMO's with sustainability and the environment in mind. 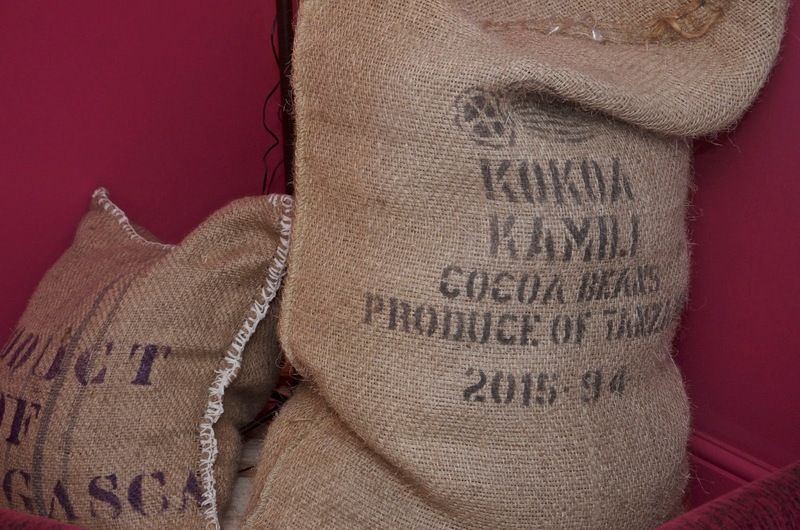 All of the chocolate comes from the Grenada Chocolate Company, a co-operative where the farmers own their own farms and jointly own the factory where the cocoa is made, so they actually earn more than Fairtrade guidelines require. 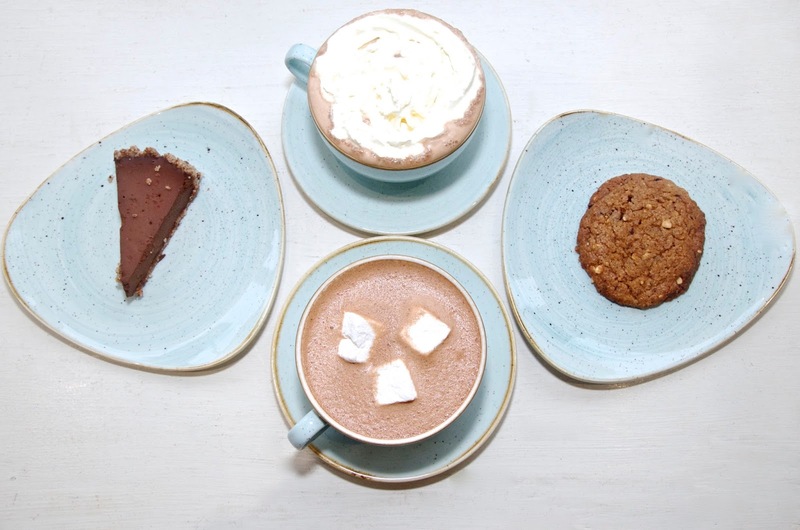 While the chocolate at Jaz & Jul's isn't completely sugar-free, it is lower in sugar than the syrupy sweet hot chocolate we're all used to and not only is that a little healthier, it's reflected in the taste too. All of these considerations add up to one thing for me... Guilt-free, delicious chocolate! For our tasting, my guest and I opted for the Peanut Butter Cookie and the Chocolate Coconut Tart. The cookie was quite subtle in terms of peanut butter flavour, lovely and crisp on the outside with a slightly chewy centre and slightly resembling an Anzac biscuit. The tart was incredible, with a lucious chocolate filling ever-so-slightly flavoured with coconut and a delicious coconut crust. 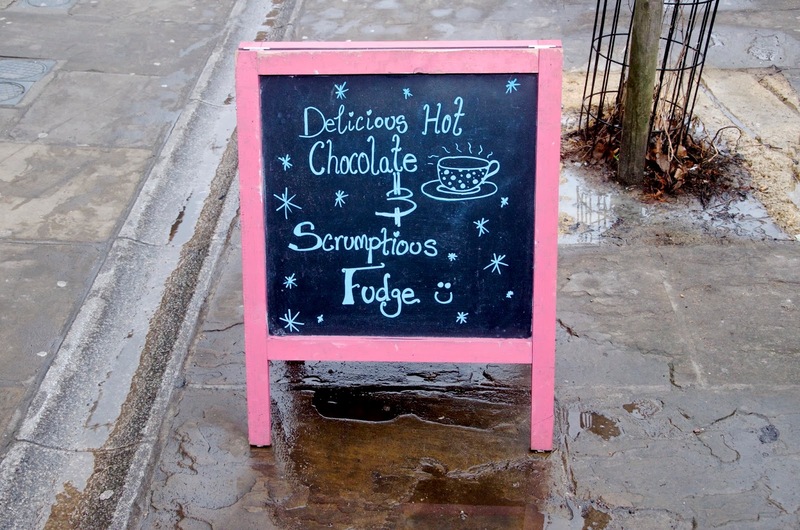 When it comes to hot chocolate, Jaz & Jul's is not a one trick pony. With a wide variety of flavours I never knew existed in the world of hot chocolate, I found it quite difficult to choose. In the end, I decided on Cinnamon Rose, a lovely, spicy option with the floral notes of rose and the warmth of cinnamon complementing not only each other, but rich chocolate. I highly recommend it! 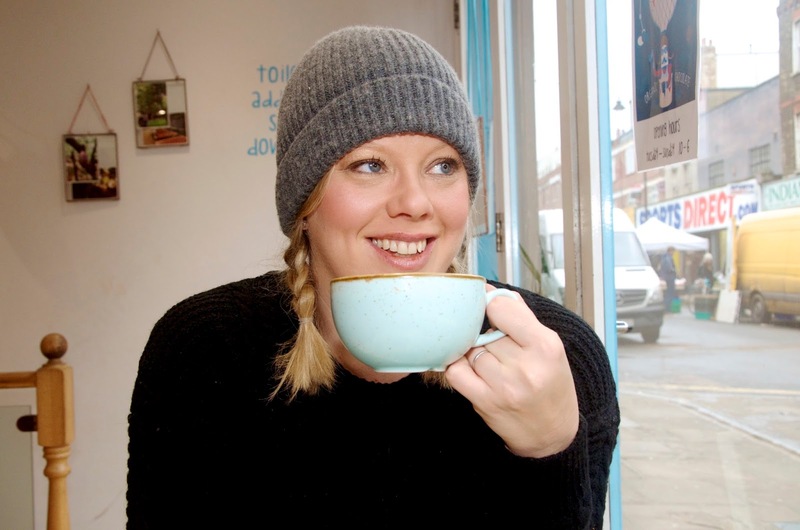 My guest chose Caralimelicious, a caramel hot chocolate with a twist of lime, another interesting flavour that doesn't sound like it works, but it's so delicious. In my cup I decided on the marshmallows, which come from Marshmallow Deli and they were so delicious, not to mention egg-free, dairy-free, gelatine-free, gluten-free and suitable for both vegetarians & vegans. My guest chose whipped cream. Of course there's an option to have both or neither... It's all about finding your own hot chocolate style and drinking it how you love it. Othere flavours as Jaz & Jul's include Orangeytang, Chilli con Choccy, Gingerbread, Man!, Masala Mojo, Mintchievous, Quite White and Raspberry Dream, so there are plenty of options to choose from. If you consider yourself a purist, there is also the Origin range for people who like their hot chocolate without any additional flavors. 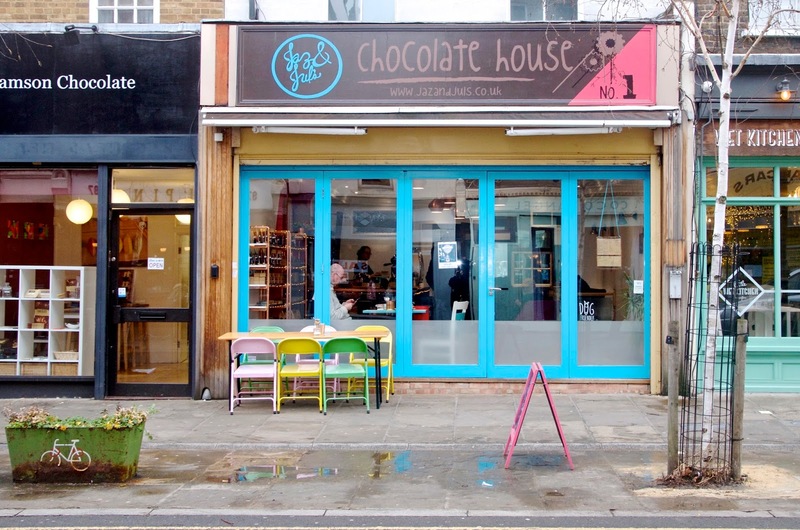 While a trip to the Chocolate House is always a good idea, it may not always be convenient, but that doesn't mean you can't have your hot chocolate. In addition to selling their products in the cafe, Jaz & Jul's also sells their delicious creations online. Naturally flavoured and made with ethically-sourced chocolate, spices and essential oils, these beauties are perfect for a gift or a treat to keep on-hand for yourself. All of the products except Quite White are dairy-free and can be made without dairy milk at home - almond and oat milks are recommended if you decide to go dairy-free with your hot chocolate. Taster packs start at £3 and there's free UK delivery on all orders over £50, so stock up. To shop or for more information, visit jazandjuls.co.uk/shop. If you're in the neighborhood, I'd definitely recommend a visit to the Jaz & Jul's Chocolate House. It's fun, ethical, lighthearted and everything I tasted there was delicious! 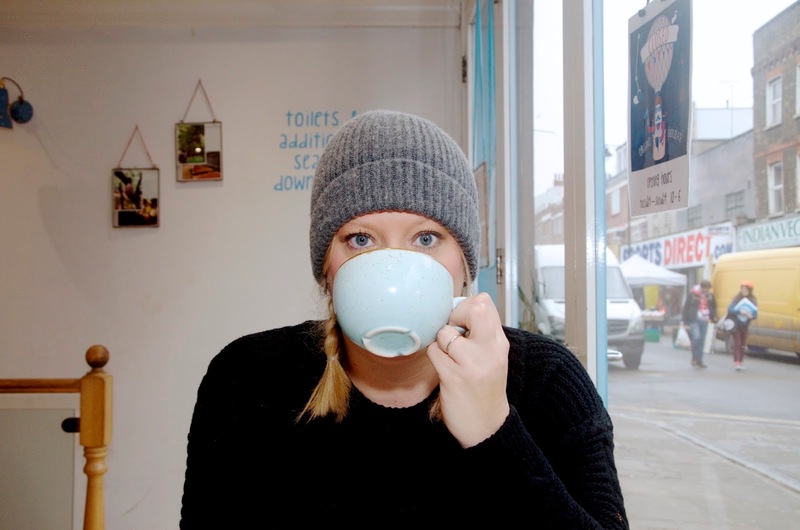 The prices are on par with most coffee shops or cafes with their hot chocolates ranging in price from £2.80 to £3.30 and extra toppings costing 50p each. It's easy to get to Jaz & Jul's from Angel Tube Station or it's about a 15 minute walk from King's Cross St. Pancras. For more information, to shop online or to plan your visit, check out their website at jazandjuls.co.uk.